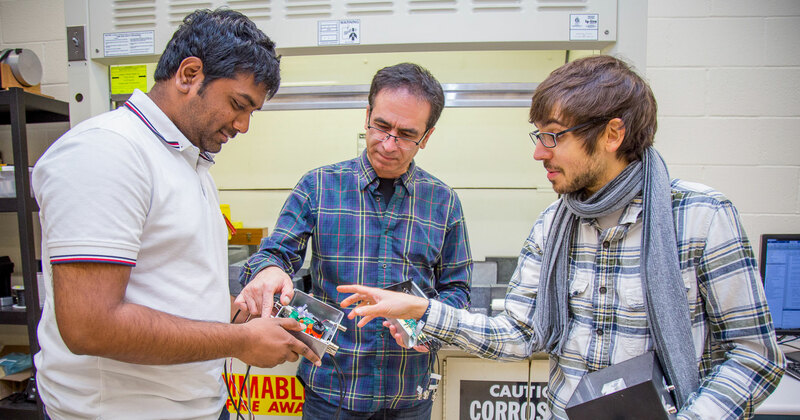 Grad Students Harish Gadey (L) and Steven Czyz (R) work with Associate Professor Abi Farsoni in the Radiation Detection Lab. Czyz took top honors for the School of Nuclear Science and Engineering (NSE) at Oregon State's 2018 Graduate Research Showcase. Gadey placed second for NSE. Nuclear nonproliferation, homeland security, and reprocessing nuclear fuel were the big picture topics encapsulating the best student research that the School of Nuclear Science and Engineering (NSE) had to offer at the College of Engineering’s 2018 Graduate Research Showcase. The annual showcase offers graduate student from across the college’s five engineering schools a chance to take their research out of their labs and, via poster presentations, explain it to the public, peers, professors, and their school’s judging panels. This year, 150 students presented. The top three students from each school were recognized for their achievements. Harish Gadey, another graduate student in the Radiation Detection Group, took second place. His research looked at improving detection capabilities for radiation detectors using metal-loaded plastic scintillators. These types of loaded plastic scintillators promise to be easier and cheaper to manufacture than traditional detectors. This would be a boon as homeland security utilizes radiation detectors at borders and airports and these detectors must be large, easy to manufacture and low cost. Detectors work by picking up the photon(s) emitted by radioactive isotopes also known as radionuclides. These photos act as signatures in identifying radionuclides. One of the problems with metal-loaded plastic detectors is that when a radionuclide is detected it generates a large Compton continuum. Compton continuums occur when the photon(s) interacts with the detector and scatters without depositing all of its energy. This is a problem, because full energy depositions help researchers like Gadey determine which radionuclide is being detected. The Compton continuum interferes with the data, because when a photon(s) with higher energy is detected it makes it difficult to see other photons with lower energy. In other words, it’s hard to tell which radionuclides are being detected. Third place went to Yana Isaichykava. Working in the Radiochemistry Group under Alena Paulenova, associate professor of radiochemistry, Isaichykava’s research informs nuclear fuel reprocessing. In order for nuclear power to be cost effective and competitive with other energy sources, it’s necessary to reprocess nuclear fuel after it’s gone through a burn cycle to recover useful elements like actinides that can be burned again, and to reduce nuclear waste. Yana Isaichykava explains her research at the showcase. The showcase gives students like Czyz, Gadey, and Isaichykava the chance to explain their research to a broad audience and show its impact both in the real world and in further academic pursuits. This helps close the knowledge gap between researchers and the public.